In order to realise the maximum cubic storage area available to any installation, it is critical to ensure that your storage system is designed specifically to your individual requirements, taking into account space, required productivity, budget and return on investment. Choose Oakway and you will receive an excellent quality of service, from initial consultations and product proposals to the completion of your installation. With hundreds of options available to maximise your storage space, you can rest assured that you will be provided with accurate and impartial advice from our friendly sales team to ensure that your particular objectives are met. Extremely versatile, popular and modular, our Spaceworks 1500 system is designed with both functionality and aesthetics in mind. Adaptable and pleasing to the eye, Spaceworks 1500 is the main choice when considering small parts storage, archive storage, filing and plastic container applications. Shelves adjustable in height every 33mm to ensure minimum loss of space and maximum storage. Available with open or fully clad bays to suit our clients particular specification. High quality, resilient powder-coated finish for years of heavy use. Supplied to site with ready assembled frames to ensure minimum disruption and installation time. Spares available from stockholdings located over 3 sites in the UK to ensure continuity of use and complete customer satisfaction. Option on all grey or with blue frames and light grey beams and shelves. Can be powder-coated to your corporate colours on contract orders, or for a small extra charge. For heavier duty applications, the Spaceworks 3000 offers all the same advantages as the Spaceworks 1500, but with a higher load capacity, thus lending itself to larger boxed goods, bulky items, light pallet storage and heavy archive use. Shelves adjustable in height every 50mm to ensure minimum loss of space and maximum storage. Standard colours are blue frames and orange beams with chipboard shelf levels. Supplied with heavy-duty bolted frames and a wide range of accessories making Spaceworks 3000 suitable for almost any application. Oakway’s carton-live storage systems have got what it takes! From lightweights to heavyweights, from cardboard to plastic, from large to small. Ideal for assembly facilities, distribution and shipping warehouses in a wide range of industries. Used by pharmaceutical and cosmetic wholesalers and distributors, by mail-order and e-commerce companies as well as publishers and book distributors. Accurate stock rotation on a first-in, first-out basis. Floor space saved – Extra space realised. Standard shelving requires an aisle for every pick face. Carton-live condenses the same material into one main block with only one load face and one pick face. No energy consumption or maintenance costs. Easy picking as cartons/containers are always easily accessible at the front of the racks. 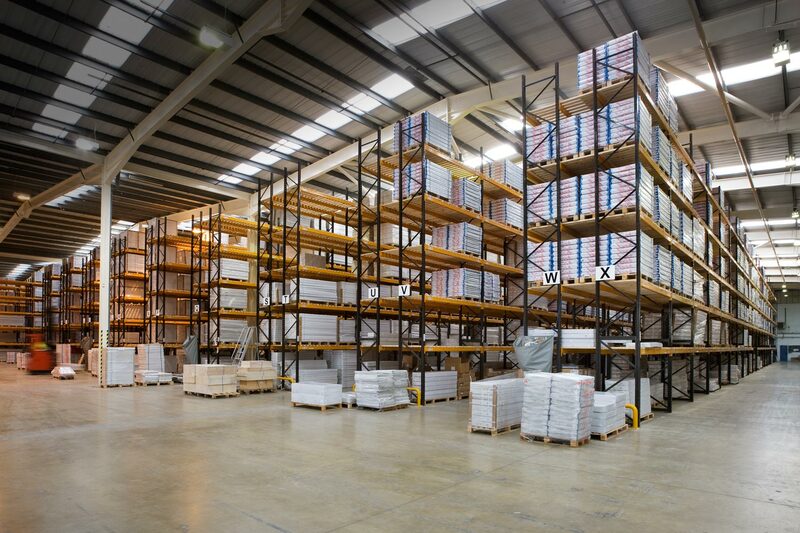 Standard pallet racking can be utilised above the carton-live, for reserve/top-up stock. Standard storage systems use 60-80% more space. Minimise operator fatigue and maximise efficiency. Boost productivity and minimise labour costs. Return on investment usually within 2 years.